I love tattoos. I also love travel. Tattooing exists in practically every part of the world in some form, and perhaps like me, when you think of Japan, their famously rich tattoo culture is one of the first things that come to mind. After all, Irezumi, or traditional Japanese tattooing, goes back many centuries, and modern tattoo culture in the West draws heavily on Japanese influences, sometimes directly appropriating Japanese styles and symbols. However, the tattooed traveller needs to be aware that many people in Japan don’t look on tattoos favourably. As a result of a dominant, anti-tattoo view and Japan’s fraught history with regard to tattooing, any traveller visiting Japan will likely find that having tattoos makes things more complicated for them – namely if they want to use a pool, spa, gym or enter traditional environments like a ryokan. In Japan, showing your ink will see you banned from certain places like pools, onsens (bath houses), gyms and many ryokans (Japanese inns). Though there are a lot of places where a foreign visitor with tattoos can show their ink as they normally might expect to – public streets, subways, most restaurants, etc – and may even receive quiet or overt compliments, a visit to Japan for the tattooed traveller takes extra research and cultural sensitivity. In places where tattoos are banned, being a foreigner won’t give you a free pass. Don’t Japanese people have tattoos? Unlike many countries today, it is rare indeed to see exposed tattoos in Japan. Many Japanese people who enjoy tattoos keep them entirely covered for social reasons, and because of the need for employment. Even Yakuza members traditionally contain their extensive ink to areas that sit beneath clothing. That doesn’t mean no one in Japan likes tattoos or has them. I received several compliments when mine were visible, and one of my favourite moments on our most recent trip was when I had a summer dress on in the subway and my forearm tattoos were showing. One particularly cool young man seemed quietly fascinated, and rolled up his shirt sleeves silently to reveal the very lower edges of his arm tattoos. We were part of some similar ‘tribe’. No words were exchanged, only a nod that my husband could take his picture as he posed nonchalantly against the train door. Though perplexing and frustrating for many tattoo-lovers, Japan’s fraught relationship with tattoos has deep rooted cultural origins and that won’t soon change. Where there are set rules in place, anyone who has come up against rules in Japan will know that no one, local or foreign, is likely to have a shred of luck bending those rules under any circumstances. And no, it isn’t so simple as ‘they’ll think you are Yakuza’. Japanese people are no fools. They know that tall white person with the backpack and the dolphin tattoo isn’t a member of a local criminal gang. But a tattoo will still see you banned from certain environments, usually politely and with some embarrassment. It’s not personal. There isn’t a simple, one sentence answer to this, but the consensus is that it’s about more than simply keeping Yakuza out of bath houses (though that is relevant). In a nutshell, there are deep-rooted cultural, political, legal and social reasons why tattoos are a complicated matter in Japan, even for the foreign visitor. You can show your tattoos in the majority places in Japan – like this cat cafe in Tokyo, below – but unfortunately you will find places where tattoos are banned. 1) Expect to completely cover tattoos at any pool, gym and most water parks and beaches. Tattoos are generally outright banned in Japan in these areas and there are often clear signs stating this. While the Japanese are famously polite and non-confrontational, you will cause embarrassment and distress, and will likely bring about a confrontation if you disobey the signs. You may be asked simply to put a shirt on, or in some cases you may be asked politely to leave. 2) Tattoos are banned at onsens (bath houses). If you have a tattoo you will be banned from pretty much any public onsen. As clothing cannot be worn in Japanese onsens (no swimwear, etc) and any tattoo is banned, including the most innocent butterfly, this is tricky. Covering tattoos in these environments with a bandage is reportedly very acceptable for Westerners, but for a range of reasons I have not tried this. Depending on the size of your tattoo, that may not be practical, either. 3) Many ryokans (Japanese inns) will not accept tattooed guests. Staying at a ryokan, or traditional japanese inn, is a unique experience worth having. However, in traditional environments like ryokans, tattoos are not looked on favourably. This remains the case even in an ever-changing, more modern Japan. Although the Japanese Tourism Agency is urging more ryokans not to discriminate against tattooed foreigners, it still happens. In order to avoid being turned away when you show up at your ryokan, it’s best to know their policy, and to cover your tattoos for good measure. Even a ryokan that is aware you have a tattoo and has allowed you entry will likely appreciate it if you keep your tattoos covered when in shared areas of the inn. 4) You should consider covering your tattoos at any temple or sacred site. There are a lot of signs around Japan for places where they are banned. You will rarely find these at temples, but any Japanese person will tell you that covering tattoos at temples and shrines as a sign of respect is much appreciated. If you can, do it. If you plan to cover up and enter one of these environments, I recommend you do so before you approach the desk or are seen by local staff, as they will be very embarrassed to have to tell you that you can’t enter. Unless your Japanese is very good, you will likely end up in a long and confusing conversation as you try to explain that you will cover your tattoos when inside. Rules are very important in Japan, and as there is a no tattoo rule in nearly all pools, onsens and gyms, a foreigner walking up to the desk with tattoos showing is bound to cause concern. Just cover up and keep those tattoos covered and that is acceptable. If you can’t cover up, don’t go to those environments. You won’t always need to cover up, but when you do, there are some simple solutions that work. 1) Use a rashie at the pool. If your tattoos are on the upper body, an easy way to cover up at the pool is by wearing rashies. They are widely available online and in some stores, and they are sunsafe too. 2) Book a private onsen instead of attending a public one. If no one sees your tattoos, they are your business. If you book a private onsen, rather than attending a public bathhouse, no one will see you naked and you will still be able to experience a Japanese onsen. We gave this a try on our recent trip and I recommend the experience. For further reading and more tips, I recommend reading this blog on visiting onsens when you have tattoos. This is obvious, but most tattoos can be covered with lightweight, long sleeve tops or pants. As my latest trip to Japan was in August, their hottest month, this was a challenge, but I kept long sleeve clothing and arm covers for times when it would be needed. Long sleeved clothes cover many people’s tattoos, and the bonus is that these can be rolled down when needed – when entering ryokans, traditional restaurants, temples or shrines – and rolled up again if you are feeling hot, or keen to flash your ink again. Likewise, neck tattoos can be covered with lightweight scarves kept in bags for just such occasions. Arm covers are remarkably common in Japan, particularly among women in summer. They are sun safe and widely available at department stores. I bought some cute lace arm covers off Etsy before I left, (seen above worn at the Sanjūsangen-dō Buddhist temple in the Higashiyama District of Kyoto) and they worked a treat. I was able to keep them in my bag and slip them on anytime I knew I would be entering a more traditional environment where my forearm tattoos might not be welcomed. Lace was not so helpful for my husband, however, but athletic style arm covers could be used if you don’t want lace. 5) Use a Bandaid or bandage. I haven’t done this, but friends of mine who regularly visit Japanese pools and onsen report success in covering smallish tattoos with bandages. This is apparently quite commonplace and acceptable. They don’t think your tattoo is going to leak into the water or anything, they just don’t want it visible. Note there is a comment below about one heavily-tattooed visitor being asked to cover up at Universal Studios, Osaka. If you are tattooed and have been to Tokyo Disney or Universal Studios in Osaka, what was your experience? In most public places, particularly in cosmopolitan Tokyo, showing your tattoos while out and about won’t particularly raise eyebrows (and you’ll see plenty of foreigners with exposed ink) but in more traditional environments you are going to make life harder for yourself and others if your ink is visible. I kept covered for much of my time in Kyoto for that reason, as well as when visiting shrines and temples, using the solutions listed above. Regardless of how you feel about it, try to be sensitive about the way your ink may impact those around you in Japan. It’s their rules, their turf. The Japanese are famously polite and friendly and they won’t want to have to tell you to cover up or to leave. Paying attention to tattoo policies in Japan will make your trip a whole lot more pleasant. If you have tattoos and you are planning to visit Japan, I hope this blog has been helpful. If you’ve been to Japan with tattoos I’d love to hear your experiences. Let me know in the comments! For further reading, try this informative piece on Japan’s Problem With Tattoos, by journalist and author Brian Ashcraft. Photographs copyright of Berndt Sellheim. Words copyright of Tara Moss. Why do people always make it sound worse than it actually is. Some Onsen will bend the rules and allow you to enter. There is also no reason you can’t stay at a Ryokan, unless it is one based around public Onsens. I lived and taught in Japan for 2 years and I have a very small (about the size of a 10c piece) tattoo by my inner elbow. In the summer it is horrifically hot and humid in the Osaka/Kobe area so I would naturally wear dresses and short sleeves. Whenever I taught I would have to remember to put a bandaid over my tattoo lest the parents who would watch me teaching see it and freak out. I was allergic to the adhesive on Japanese bandaids so it was awful. On rare occasions when I forgot to put a bandaid on before teaching, I would literally have to teach while trying to keep my inner-elbow for the entire lesson. On the topic of theme parks, I personally had no issue in Universal Studios (Osaka), but a good friend of mine who has full sleeves and arms done was chased down by staff in the height of summer last year and asked to put on long pants and a shirt. So don’t try it there if you’re heavily tatted, or at least call ahead and check if they’ve changed their policy. I am so pleased you had no issues. Japan is a great place. 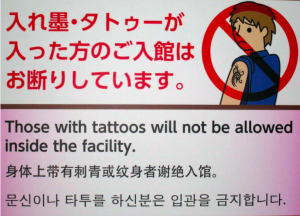 However, it must be said that foreigners with tattoos encounter difficulties with regularity in Japan, including bans from different properties and pools. This is reported widely in the news, online and elsewhere, and is a matter of stated policy at many facilities encountered by the every day tourist. Even knowing what I did, we still encountered issues when checking into standard hotels, with staff worried about giving us pool passes because some ink was showing through our clothes. It is good to make people aware of potential problems so they can prepare solutions. Thank you so much for posting this, I don’t have tattoos but I have a teenage son who can’t wait to get to Japan and would like to teach there one day. I will show him this blog and if he is interested in getting tattoos at some point in his life, he will know to be mindful of these customs! I’m sorry you were referred to as “she” in your own blog comments area, I found that disconcerting and upsetting, particularly given your very personal approach to your on-line presence. I used to live in an office in eastern Shinjuku. This office – I assume like most offices – had no bath, so each night I’d go down to the closest sento (communal bath) to soak and maintain a socially acceptable level of hygiene. This particular sento was a tattoo-friendly establishment and subsequently it attracted some hardened yakuza types. It was interesting to watch other bathers – some had only just arrived – when they saw these guys inked with elaborate designs with missing fingers and huge stab wounds enter the bathing area. They never caused me any troubles, but their appearance shifted the gravity in the bathhouse. Good times. This is fascinating, David. Thank you for sharing. I wondered what openly tattoo-friendly onsens/sento might be like. PS Thanks for mentioning the experience of your friend at Universal Studios, Osaka. I do wish the policies were more clear. In terms of booking a ryokan, we went through a Japanese travel agent and announced that we had tattoos so the agent could book a ryokan comfortable with tattooed foreigners. (This was in Kyoto.) We used their private onsen and covered up in shared areas of the ryokan. One older man on the street saw my husband Berndt get out of a taxi with his shirt sleeves rolled up in the heat and said something like ‘You stay here?’ (the traditional ryokan) ‘With those?’ And did an awed thumbs up. ‘Cool’. My husband did roll down his sleeves again as he entered though! I’ve been tutted at and outright scolded in the middle of the street by old men in Japan for my extensive visible tattoos, but I’ve also had other old men come up, grasp my hand in theirs, and *kiss* the one irezumi piece I have on my arm! I try to keep them covered as much as I can when I’m there, as a sign of respect, but sometimes the humidity makes it pure torture to do so. I have a friend who was a teacher in Shizuoka who always wore arm coverings on hers, but one of her co-workers had a small back tattoo that was revealed one day when her shirt rode up, and the parents of her students were extremely keen for her to be removed from her role when they found out. Thank you for your insights, Mary. The humidity in summer certainly makes covering up a challenge. How sad that a small back tattoo can see someone out of a teaching job. I enjoyed reading your piece. As a gaijin who lives in Japan and has done so for many years I agree with many of the things you write about. I feel it should be stated that the beach in some cases and places is also a no go place fore tattoos. I have been asked to either cover up or leave the beach because of my Tattoos. Also travelers should be aware that should they feel like taking a stance towards the establishment/place in regards to the tattoo rule then do not be surprised if the police turn up and ask you to leave. It has been known to happen. Local Gyms are also a no go withe the only exception I know of being Gold’s Gym, cover it and your cool. What a great article! Well researched and written as always. I was in Japan a year and a bit ago, and overheard an interesting conversation regarding head/scalp tattoos (I think the man may have been from New Zealand). Never had a problem when he was younger, but his hair is now naturally thinning and he talked about the challenges of dealing with it in the heat/humidity as well. Standard baseball caps work great in most situations, but not appropriate for high end restaurants, business meetings etc. I almost giggled out loud when he recounted the times he used his girlfriend’s gel eyeliner and/or hair touch up spray to ‘paint’ his scalp and hide the tattoo. Fun times in Japan! My tattoos aren’t visible a band aid would be insufficient. I enjoyed the pleasure of onsen but it was in an accepting establishment. Met many tattooed Japanese people when working and living there. Not your conservative types but people who identify with subcultures and are outsiders. Very useful article, thank you. I hope to visit Japan this year so I will remember your advice when planning and packing for my trip.